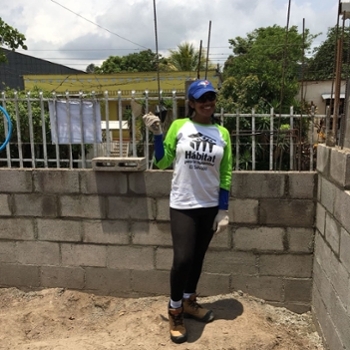 Maiya Mistry participated in a faculty-led program abroad to El Salvador. She is a Criminology student, with a minor in Human Rights and Human Diversity, on the Brantford campus. I left El Salvador a different person—a better person—than who I was when I stepped into the airport only weeks ago. Honestly, it baffles me that so much self-reflection, transformation and passion can emerge in such a short amount of time. But here I am, preaching every word because I genuinely feel that this experience has made me realize that life is about more than hot showers, overpriced meals at restaurants and buying clothes that you really can’t afford in order to impress those you really don’t like that much anyways. I packed a 30-pound suitcase to El Salvador—no oversized makeup bag or fancy clothes or high heels—but somehow I felt more alive, more fulfilled, than I have ever felt before. I think one of the oddest things about this feeling is just how much I want to share it with others. I want others to see the pictures we took of the El Salvadoran sunset over the volcanoes. I want others to try to empathize with the children who struggled to read the numbers on the deck of cards we shared with them. I want my friends to feel the compassion and dignity that radiates off the local merchants, officers, and survivors of the El Salvador civil war. I think that maybe this is what altruism feels like; I want to share and give and help others to look both inside and outside of themselves in order to feel a little more whole and a little more human. I can’t really explain to you why I am suddenly feeling this way. It seems as if I have come back to Canada, our selfish country, a little less selfish. I don’t really know if this will serve to be an advantage or disadvantage in my country, but I am still excited because this feeling of enlightenment, the realization that caring for people is instinctive, colourful and rewarding, has allowed me to reap the benefits of living and loving with a team. I was determined after returning from El Salvador to make sure that the time I had spent there, the lessons I had learnt, and all of the growing I had done, did not go neglected. Therefore, after returning, I decided to change my minor from Policing to Human Rights and Human Diversity. I want to be able to advocate for others without opportunities and share the wealth (not just of money) but of support, resources, and communication, with communities all over the world. I have only recently realized how largely geography impacts the successes of an individual. I would like to challenge this barrier and, more importantly, I would like to provide a platform for intelligent, compassionate, hard-working individuals who are disadvantaged by geography to thrive, like me. Before this trip to El Salvador, I did not realized how lucky I was to have been born into a country where government assistance, academic institutions, and international experiential learning not only exists, but can also be obtained by almost every citizen. One of the most astonishing pieces of information I have discovered is how difficult it is to apply for a visa as a citizen of El Salvador. An individual is required to meet a series of very specific qualifications, obtain recommendations, and sometimes they are required to be “invited” by another important organization of the country they wish to travel to in order for their visa to be approved. This issue affects (and has personally affected) some of the El Salvadoran individuals we met on our trip. Although I am faced with many disadvantages, both as a woman and as a visible minority, I am still a citizen in a country that is very powerful and wealthy. I am eligible for OSAP, grants, and scholarships, and my rights as an individual are protected and highly valued. My career pathway may change, and yet, I will not have to sacrifice as much as those who live in other regions or other countries, because I live close to Toronto, I live in a large city with opportunity and visibility and relevance, and in an institution such as academia, I thrive. I cannot imagine living without academics, without intellectual challenges, or scholarly resources, which help me to grow and improve. I did not realize how exclusive the opportunity to function as a student was until I travelled to El Salvador and met children and adults who were not granted the opportunity to go to school or pursue postsecondary education. I arrived in El Salvador petrified. I was out of my element. I hated the humidity, I was worried that my hair was going to frizz over and I wouldn’t look good in the eyes of the other members of my team. I felt insecure because the colour of my shirt didn’t match the colour of my capris. I didn’t know the language. I hated bugs, and being outside. I was not physically strong, and I did not belong anywhere but in a “first-world” country. I took pride in it. However, that was before I immersed myself fully into the country. Before I learned to accept the kindness of the warm breeze in the morning, the chirping of the birds, teamwork, resilience, friendship. It was before I could appreciate the meaning of sacrifice, and humility, and selflessness. It was before I could experience the strength of forgiveness, and the pleasure of love. It was before I was able to open myself up to another degree of “real life”. It was before I realized that life is not defined by how many items you have in your closet, but that life is defined by who we love, and how we learn, and what we are able to leave behind when we are finally gone.